We asked the private flyers of tomorrow to write their own ticket. The analysis of 3,345 contest entries shows what they are looking for. A DRAFTSMAN in the evergreen section of the Pacific Northwest wrote Popular Science Monthly last fall that of all the things he would like to see incorporated in his postwar private airplane, a foot throttle was on the high-priority list. He wanted other items of comfort, too, did Tom Phelan of Seattleâ€”a cigarette lighter on the instrument panel, and arm rests built into seats for his passengers. 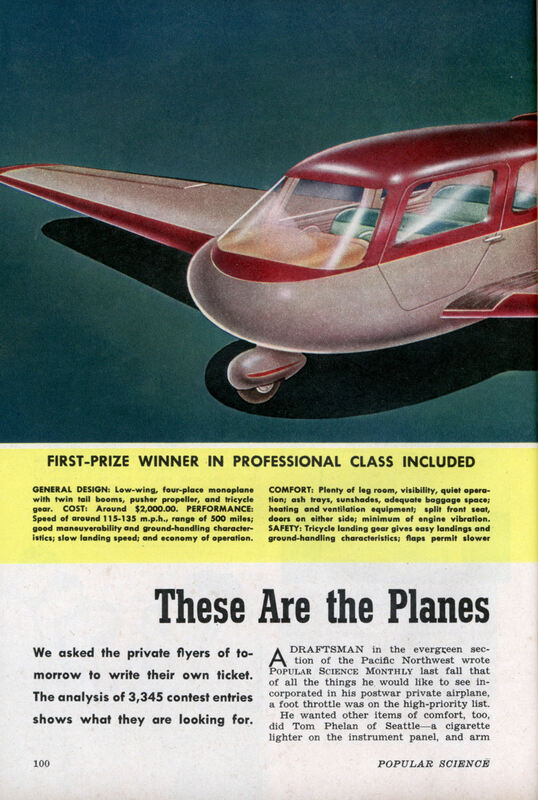 Tom Phelan was one of the many entrants in this magazine’s “The Plane You’d Like to Own” contest, concluded September 30, who displayed a flair for merchandising. The automobile never would have sold in the millions if it had not had, first, utility; and second, comfort. The personal-type airplane won’t sell in the postwar years unless it has both in generous proportions. Comfort runs a close second to safetyâ€”which is first on the list of demands, by the wayâ€”in the features tabulated by the board of judges from the 3,345 entries in the contest. After safety and comfort come good looks, practicability, and performance, in that order. In the December issue we announced the winners in the contest, which drew designs from each of the 48 states and 10 foreign countries, and briefly sketched the outlines of the composite aircraft that the buying public will want when the war is over, as reflected in those designs. This month we are going to make a recapitulation and draw up a bill of particulars. How many of the entrants wanted folding wings? How many wanted slots and flaps, those devices that make for greater safety in flying? How many wanted two engines instead of one? Two-control aircraft? Some of the answers are surprising. They surprised the judges, and they surprised the staff of Popular Science Monthly, which, in the intervening months, has had an opportunity for a more leisurely analysis of the results. The designs submitted reflected credit on the readership of the magazine. The entrants knew what they wanted. And what they wanted is a fair sample of the public’s tastes in personal air transportation. A monoplane, with a low wing. An engine of about 125 horsepower. A landing gear of tricycle design. A capacity of four persons. A speed of about 130 miles an hour. A range of about 500 miles between refuelings. In outline the plane will be a wing cradling a fuselage that will carry its power plant in the rear. On either side of the fuselage, anchored to the wing, will sweep back a boom to accommodate the tail stabilizing and control surfaces. Safety considerations, of course, came first. That was natural. Americans have always demanded a high safety factor in their automobiles; it is even more important in planes designed for private flyers. On tricycle landing gear the majority was agreed. There is a story behind that. As a safety factor, tricycle gear was a feature of practically all the earliest airplanes, built just after the turn of the century. A tricycle – undercarriage plane sits on the ground with all the stability of a milkmaid’s stool. It permits the wing to be at a negative (no lift) angle of attack at the start of the take-off run and during the landing run. Tricycle wheels afford a pilot a lot more visibility than does the more conventional undercarriage. The nose doesn’t stick up to obstruct his view of the ground while taxiing. Moreover, as an added safety factor, a tricycle-wheel job can be taxied in circles by a novice in a 40-mile wind. It takes an expert touch on the controls to do that in a plane equipped with two main wheels and a tail wheel. One of the principal reasons why tricycle gear was abandoned as the airplane grew up was that a level wing provides no braking action in the landing run. In those days, wheel brakes were unknown, and the “drag” of the uptilted wing was counted on to bring a plane to a stop more quickly. Today, good brakes enable a pilot in a three-wheeled plane, coming in for a landing at considerable speed, to stop as “short” as a pilot using conventional gear in a full-stall landing. Nearly 75 percent of the non-professional entrants and more than half of the professionals specified tricycle undercarriages. Then there was the problem of propeller placement. A whirling propeller is potentially dangerous. People can walk into it on the groundâ€”as not a few have. So nearly 50 percent of all entrants in both classes wanted the propeller in the rear of the cabin, enclosed in most instances between twin booms extending backward to carry the tail stabilizing and control surfaces. The contestants had other reasons for favoring pusher propellers. Since the propeller creates much of the noise developed by an airplane in flight, putting it in the rear reduces the noise level. The pusher provides better visibility forward, reduces the chance of getting engine fumes in the cabin, andâ€”an important safety considerationâ€”creates less danger to the occupants in case of fire. Incidentally, speaking of engines, that jet-propelled design of Pfc. Don L. Fotheringham, U. S. M. C, FPO, San Francisco, winner of the $1,000 War Bond first prize among the non-professionals, created quite a stir. It was revolutionary thinking. But his ideas had solid support. The turbineâ€”related in principle to jet propulsionâ€”has been adapted to locomotives by one of America’s big railroads, and automotive engineers are talking freely of the day when the gas turbine may replace the internal-combustion reciprocating engine in your automobile. But only six percent of the nonprofessionals wanted jet-propelled craft, and only half that proportion of professionals favored them. Safety, of course, meant the incorporation in the designs of the standard devices to insure control at low speeds. Forty percent of the entrants in each class specified slots and flaps. The slot insures a smooth flow of air over the ailerons for lateral control when the wing is at, or even below, the stall point. The flap, called a “high-lift device” by the engineers, actually adds to the wing area or so changes the shape of the wing as to achieve the same result. Interestingly enough, only 14 percent of the nonprofessional entries and 16 percent of the professional were designed to be spinproof. Yet there was no lack of ideas for other safety devices. Charles E. Planck of Arlington, Va., for instance, favored the installation of a stall warning device on the leading edge of the wing. Partly as a safety factor, 29 percent of the nonprofessionals and 20 percent of the professionals specified two engines. Stanley D. Whitaker, of Los Angeles, winner of a $25 War Bond in the professional class, submitted a design with wings that pivoted to maintain a correct angle of lift regardless of the attitude of the plane as a whole. Another entry figured that small rocket units attached to the underside of the wing would give his plane that extra speed he would need in an emergency. He was on solid ground, tooâ€”U. S. military planes now use rocket-assisted take-off. Not to be overlooked was a suggestion by Murrel D. Hobt, at the AAF convalescent hospital in St. Petersburg, Fla., that spring-fitted safety belts be provided. Comfort features abounded. If there is anything typically American, it is a demand for comfort. Many of the entries included a commercial band on their radio sets for entertainment during those long hours in the air on cross-country trips. And there was something else behind that, too: a simple “homing loop” on an airplane, tuned to a commercial-band broadcasting station, can be of inestimable value in air navigation. The enemy knows that. That’s why he shuts off his broadcasting stations when our bombing fleets take off to saturate his war industries with explosives. There were other items of comfort specified: rear-view mirrors, so a man wouldn’t have to twist and turn in his seat to see what was behind him as he made a turn or a climb; better ventilation, glove compartments, ash trays, sunshades, heaters, extra leg room, and plenty of baggage room. The owner of a personal-type air-plane can’t get full utility out of it unless he has space to stow away his fishing tackle, golf bag, a picnic hamper, bags, and Junior’s playthings. Homer O. Hacker, of Dayton, Ohio, who collected $500 in War Bonds as second-prize winner in the professional class, wanted built-in hangers for coats and spare jackets. And, to simplify the job of tying down his aircraft for the night, he included a steel roll-up device for the underside of the wing that could be attached to a stake or other object. Several designers, including Harold B. Stucky, of South Hutchinson, Kan., winner of a $25 War Bond in the nonprofessional class, specified a ladder for easy entrance to his airplane. Other entrants had their ladders sliding out of the floor or door, and even out of the wing. Going the whole way on comfort, some designs were complete with built-in beds. More than half the nonprofessionals wanted four-place planes, while 43 percent of the professionals said that would be the amount of seating capacity they would require. Several designers suggested a front seat wide enough for three people and a small fold-up seat behind it. Butâ€”and here was a poser for the judgesâ€”only eight percent of the nonprofessionals and six percent of the professionals wanted planes with two controls instead of three. A two-control airplane dispenses with rudder pedals by integrating the rudder control with the ailerons or by carrying a fin so designed as to overcome the normal “yawing” movement in a turn. The chances that your postwar plane will have a wing attached to the bottom, instead of to the waist or the top, of the fuselage are pretty good, judging by the contest preferences. Almost every second one of the nonprofessional entrants preferred the low wing. Only every fourth one of the professionals wanted it. If you fly an airplane, you know what the choice between the low wing and the high wing comes down to: largely a personal preference. In a turn, a high wing blanks out the area into which you are turning. A low wing blanks out your view of the ground. A high wing has “pendular stability.” A low wing provides a lot more all-around visibility. A high wing supplies clearance over such ground objects as bushes. A low wing is cleaner and has less “drag” because normally it has no struts. The nonprofessional contestants favoring high-wing monoplanes ran to 18 percent, while the professionals totaled up to 36 percent; the mid-wing type enjoyed a vote of eight percent among the nonprofessionals and 17 percent among the professionals. Then there was the vote on amphibians. The amphibian is a sort of jack-of-all-trades. If a smooth landing surface is available on the ground, the amphibian can use its wheels. If it can’t find smooth ground, or if the pilot simply chooses to use a water surface by preference, it can be put down on a lake, a river, or the protected blue water of a cove. The pilot who likes to operate off water makes an interesting discovery when he begins exploring the surface of continental United States: it is pitted with depressions full of water. One pilot using an ordinary seaplane flew all the way across the northern tier of states from the Atlantic to the Pacific and never lacked a landing place. One out of five of the professional entries and 16 percent of the nonprofessional specified an amphibian-type airplane. Louis Aron of Hamilton, Ont., entered a design with wheels fitted into the sponsons, or water stabilizers. Mounted horizontally when the plane was water-borne, they were turned downward for land operation. The third prize winner in the professional class, AAF Capt. Adam J. Stalzenberger, Wright Field, Dayton, Ohio, submitted a sleek, two-place amphibian with a molded plastic hull. He used wing floats as housings for wheels. His design won him $300 in War Bonds. The straight seaplane fared badly. It drew support from only five percent in each class of entry. There were other surprises. Notwithstanding the considerable publicity given rotating-wing aircraft in the last two years, only 10 percent of the professional and 15 percent of the nonprofessional wanted whirligigs. Of the contestants who did submit designs with whirling wings, two gave the judges pause. Henry G. Howell, of Los Angeles, submitted a two-bladed “paddle wheel” helicopter intended to carry two passengers. Another, also for two passengers and fitted with four blades operating on countra-rotating hubs, was entered by Cpl. Robert W. Huzzard, of the Clinton County Army Air Field, Wilmington, Ohio. The judges frankly had some preconceived notions of what kind of designs would be submitted in the contest. 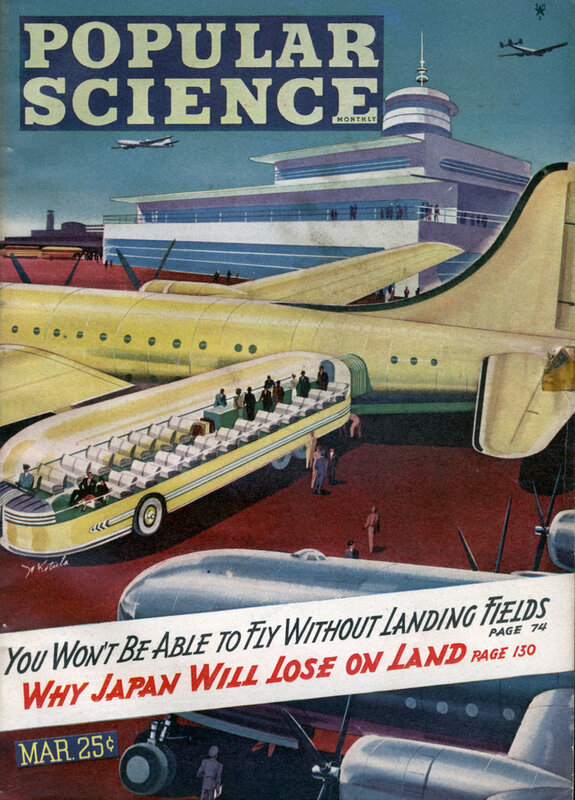 They figured, for instance, that the readership of Popular Science Monthly would heavily favor types of planes that could be converted to highway use. And they found that they were mistaken. The vote on “roadability,” as it is called, ran even lower than that on rotating-wing aircraft. Nevertheless, some novel roadable-plane designs showed up. H. D. Boggs, of Omaha, Neb., for instance, drew up a fuselage that could shed its wings and be cradled in an automobile chassis for highway use. For flight, the fuselage was lifted from the chassis and fitted with wings. A single engine, both for the road and for flight, was mounted in road and for flight, was mounted in the fuselage. Incidentally, but 14 percent of the nonprofessionals and seven percent of the professionals wanted folding wings. The professionals practically ignored airplane construction incorporating plastics or plastic-impregnated plywood. Seven percent of them liked plastics. But 20 percent of the nonprofessionals toyed with the idea of plastics. The choice on aircraft prices in relation to speed, carrying capacity, and solidity of construction was one of the biggest surprises of the contest. It was natural to assume that the public would want a low-priced airplane. A decade ago a Government department, in fact, publicly encouraged manufacturers to produce a “$700 airplane” for the average family purse in the thought that a modest price would lead to more widespread private flying by putting airplanes within the reach of a larger proportion of the population. But the contestants said most emphatically no, they preferred to buy planes priced in the same class as the better automobiles. They wanted nothing under $1,000 if it didn’t pay for a better type of aircraft, and they backed up their statement with designs that included luxury items. Luxury items cost money. Popular SCIENCE Monthly is proud to have sponsored the “Plane You’d Like To Own” contest. It set a high-water mark in surveying the public’s tastes in postwar personal-type aircraft. Magazines and newspapers throughout the country printed news stories about it. Undoubtedly, it will contribute to the advanced thinking going on in the rooms marked “No Admittance” in factories where tomorrow’s designs are in the making. Planes incorporating many of the features in the plane you’d like to own will be rolling off the assembly lines pretty soon. When, at last, you are able to walk into a salesroom on “airplane row” and pick out a sky runabout, it will show the results of this sampling of private-flyer opinion.